March in Asia is exciting as seasons transition, trees blossom, and the landscapes emerge from winter. Although very hot, Thailand and neighboring countries in Southeast Asia will be experiencing peak dry season. Meanwhile, cold weather will begin to slack off across East Asian destinations such as China and Korea. Humidity will still be low for many countries in March. India and much of South Asia will be hot but not as bad as they will be in April when temperatures over 100 F can be a daily occurrence. Asia's landscapes come alive again in March. The blooming cherry blossoms are particularly celebrated throughout Japan with picnics in parks, gatherings, and hanami — the act of deliberately viewing flowers. If Bali is in your plan for March, check the date for Nyepi, the Balinese Day of Silence. Many tourists get caught by surprise every year, and yes, Nyepi will certainly affect your trip. The entire island shuts down, even the airport closes for a day! No entertainment, noise, or traveling are acceptable during the Day of Silence. Tourists aren't exempt and are expected to remain quietly indoors for 24 hours. Men patrol the street to enforce restrictions. Dates for Nyepi change annually, but the celebration often hits in March. The night before Nyepi is a rambunctious party with plenty of fire and spirit-spooking rituals. March is the peak month for annual slash-and-burn agricultural fires that rage out of control in Thailand along with neighboring Laos and Myanmar (Burma). All destinations in Northern Thailand such as Pai, Chiang Mai, and Chiang Rai will be adversely affected. Particulate levels in the air often reach threatening levels in March, stinging eyes and causing many locals to don masks. People with asthma or respiratory problems should check before planning a trip to affected areas in the northern part of Thailand. Air pollution and haze choke the air until Thailand's rainy season arrives in May to quench the fires. March reinforces its reputation as a rainy month for southern destinations in Southeast Asia such as Kuala Lumpur, Singapore, and the island of Bali. Meanwhile, northern places experiencing peak season will be very hot and dry. Afternoons can become unbearably hot and humid in Laos, Cambodia, and Thailand. India will be hot and dry during March, as will the southern half of Sri Lanka. In Borneo, the state of Sabah (Kota Kinabalu) will enjoy better weather than Sarawak (Kuching). Temperatures in Beijing can still hit freezing at night, and Tokyo will be chilly but tolerable as people head out to see the flowers. Layers are always a good idea when packing, but if planning for China, Korea, Japan, or India, they're more important than ever. Swings of over 20 degrees between daytime and nighttime temperatures can feel drastic and throw off the immune system. Even New Delhi with temperatures over 90 degrees Fahrenheit on many days can experience evening temperatures in the low 60s! Pack for heavy downpours if you'll be traveling in Kuala Lumpur or Singapore. Have a good plan for waterproofing your passport and electronics in case you get caught while out. The Holi Festival: Definitely the messiest of the festivals in India, the Indian Holi festival is all about covering friends and strangers with colored dye while in a dancing frenzy. Colors aren't just thrown around in India; you'll find celebrations across Southeast Asia in places with sizable Hindu populations. You may luck into a Holi celebration in Singapore, Penang, or Kuala Lumpur in Malaysia. Carnival: Fat Tuesday occasionally hits in March, however, the Christian holiday isn't given much focus in Asia. Even the Philippines doesn't make as big a deal about Carnival as one would expect; Easter is a much bigger event there. A large dance celebration is held in Goa, India, where Portuguese colonists introduced the holiday. But then again, there's always a d party in Goa! Hanami Cherry Blossom Festival in Japan: Celebrated on different dates throughout Japan as the trees bloom, groups and families flock to parks for picnics and hanami — literally "flower viewing." It's a fun, social time to be outside in the spring air. The end of March and all of April are great months to be in Japan for enjoying the beautiful-yet-fleeting blossoms. Full Moon Party in Thailand: The monthly Full Moon Party in Thailand will be in peak form in March as tens of thousands of revelers cram into Haad Rin on the island of Koh Phangan. Don't complain: Either join in the madness or avoid the area altogether! The party actually fills accommodation and transportation in the islands on that side of Thailand. Nyepi: The Balinese Day of Silence follows a rowdy New Year celebration, usually in March or April. Tourists are expected to remain inside their hotels for 24 hours; all activity on the island shuts down, even the airport. Participation is mandatory! March is a great month for visiting Nepal. Kathmandu will still be enjoying the dry season, and humidity will still be low for enjoying mountain views. For travelers planning to hit the Himalayas, there will still be plenty of snow and cold temperatures in March. But March is a good month for trekking before the trails get even busier with climbing season in April and May. Spring flowers will be blooming along the slopes, and visibility will be good. Climbing season for Everest doesn't really begin until May, however, teams may be making some preparations at Everest Base Camp in March and April. 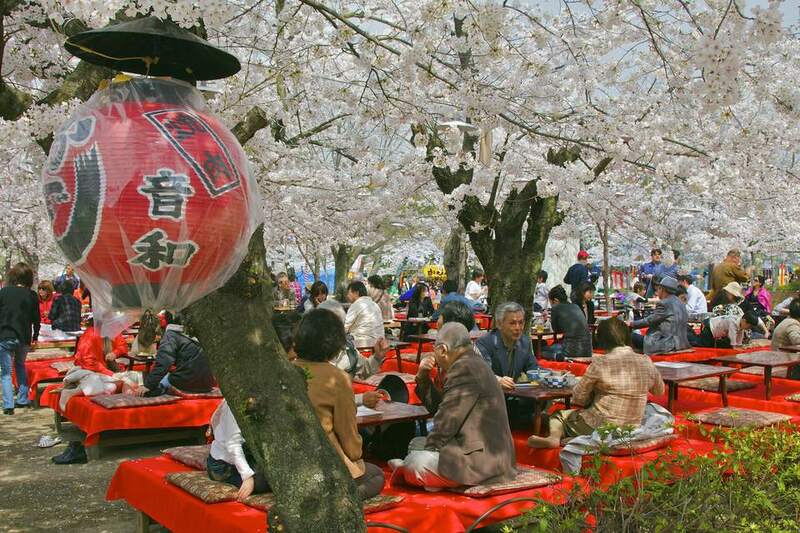 Public parks in Japan may be exceptionally busy as friends, coworkers, and families hold picnics beneath the blooming cherry trees. Food is a given, but sometimes a little sake helps to warm things up. Anything you wear to a Holi festival will inevitably be permanently stained! Wear something white then keep the Holi-colored masterpiece as a souvenir. Remember that the dye will come out and stain other items pretty much every time you wash it. Check out our guide to visiting Asia in the spring to see if your trip timing is ideal.